I am sure most families in America have some version of this basic three-ingredient appetizer. And while this one is not particularly unique, it is the one my kids associate with Thanksgiving and grandparents. My mom was not much of a cook. What she prepared was always delicious, but she didn’t necessarily enjoy the culinary arts. So when it came to holiday feasts, she was content to let me prepare the main meal. However, she would always volunteer to bring sausage balls for Thanksgiving breakfast. Mom would make a double batch and freeze them in a two-gallon plastic bag. This batch would last us through the winter season. As a special morning treat, I would take a few out of the freezer, place on a paper plate, and microwave about 90-seconds. Perhaps not the most nutritious way to start the day, but it did provide a protein alternative to Pop-Tarts. On low speed, mix until completely blended. For easy clean-up … line a jelly roll pan with foil and then spray with Pam. 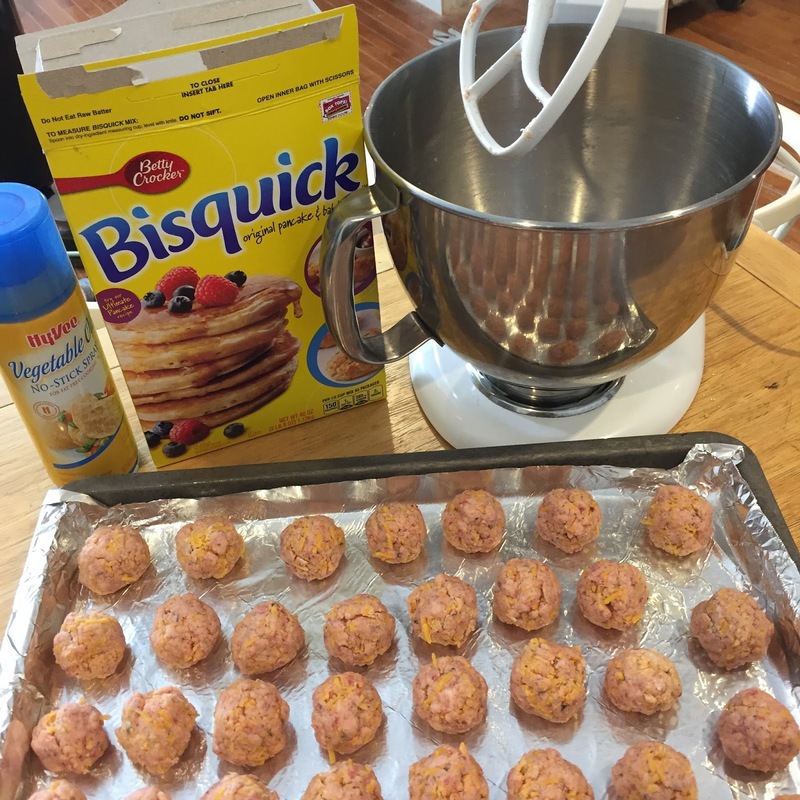 Pinch off about a tablespoon of sausage mixture, roll into a ball, and place on prepared pan about one inch apart. Serve warm – or allow to cool before placing in freezer bags for longer-term storage. For a spicier sausage ball, I have mixed a package of regular sausage with a package of hot. Or I have added a bit of cayenne pepper to the Bisquick before mixing. I haven’t tried this (yet) but I think replacing the cheddar cheese with Monterey Jack would give the balls a unique flavor. Oh these sound really good. And I like that idea of freezing them for a quick snack or breakfast. I may have to add this to my holiday menu plan. That does sound like a very fast recipe! Yep, my mom used to make something like this. I haven't had a sausage ball in ages. It looks so easy and I'll bet everyone loved it! These sound delicious. I'm visiting from Weekend Cooking. Sausage balls are a nice tradition. I wonder what could be used instead of Bisquick…would that be flour and baking soda or powder, maybe? I've never made (or eaten!) sausage balls but they sound like they'd be delicious.